Does healthy eating come at a cost? We’ll explore this question and more during a screening of the film, Food Stamped at Mystic Museum of Art. 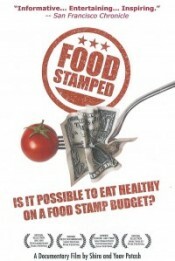 Food Stamped follows a couple as they attempt to eat a healthy, well-balanced diet on a food stamp budget. The film won Best Documentary at the Lighthouse International Film Festival and Jury Feature Prize at the San Francisco Independent Film Festival. Start the evening with a brief food demo and tasting from local vegan local vegan/vegetarian restaurant, Kate’s Cafe. Following the film, Writer and Moderator Brian Trent, will facilitate a discussion about food with local farmers, restaurateurs, and social sector executives. Craig Floyd runs Footsteps Farm in Stonington, Connecticut – the only certified human farm in the state. Dan Meiser is owner of the recently opened, highly successful farm-to-table Oyster Club Restaurant in Mystic. Lisa Tepper Bates leads MASH (Mystic Area Shelter and Hospitality) as their Executive Director. Kelly Horton is Vice President of the Gemma E. Moran United Way/Labor Food Center & Food Policy Council. The screening is part of a series events sponsored by Connecticut Humanities throughout the remainder of the year in observance of National Food Day (October 24).